RAM Commander’s Fault Tree Analysis (FTA) software module is the one of the unique features of the RAM Commander. It is simplified FTAnalyzer, fully integrated with RAM Commander product tree, reliability prediction and FMECA. It implements and summarizes the first-hand experience gained by the ALD FTA experts in hundreds of projects using RAM Commander and other ALD software tools. • Up-to-date, intuitive and powerful fault tree diagram interface allowing full control over the diagram: elements location, colors, styles, zooms, etc. 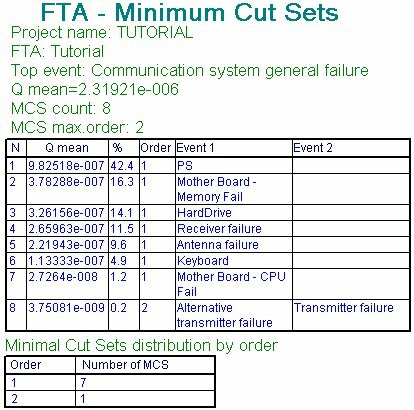 • Set of required reports – FTA diagram, MCS, events library etc. • Data import from RiskSpectrum, Aralia SimTree, CAFTA and Isograph FaultTree+Fault Tree Analysis is one of the most widely used methods in system reliability and failure probability analysis. A fault tree is a graphical representation of a logical structure representing undesired events (“failures”) and their causes. You create the logical structure by using gates and represent undesired events by using basic events. Reliability parameters are assigned to the basic events. 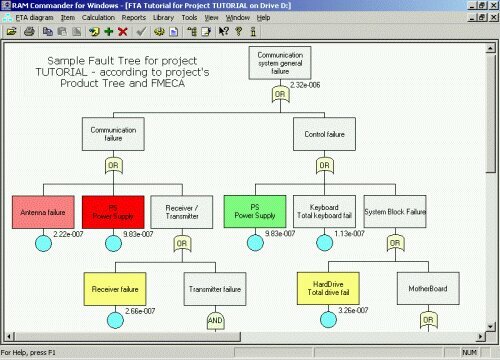 Widely used in system reliability studies, fault tree analysis offers the ability to focus on an event of importance, such as a highly critical safety issue, and work to minimize its occurrence or consequence. The probability of the top-level event can then be determined by using mathematical techniques. The resulting fault tree diagram is a graphical representation of the chain of events in your system or process, built using events and logical gate configurations. After Unavailability calculation and MCS analysis, Importance and Sensitivity Analysis may be performed. Importance analysis results help to select those fault tree events, which contribute most to the system’s unavailability. 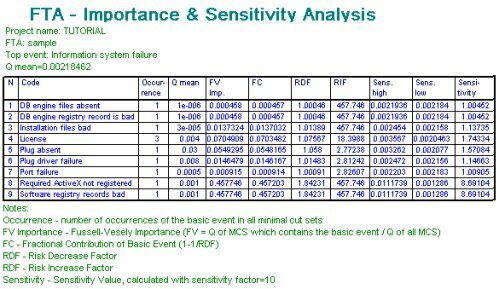 Sensitivity analysis helps to choose those events, where a relatively small change will lead to a relatively large system unavailability changes. Calculated values are Fussell-Vesely importance (FV Imp), Risk Decrease Factor (RDF), Fractional Contribution (FC), Risk Increase Factor (RIF) and Sensitivity Value for each Basic or Undeveloped Event. Fault Tree Analysis is acknowledged as a key tool for increasing safety. It is unique and indispensable in analyzing risks and determining various combinations of hardware, software, and human error failures that result in a specified risk or system failure. Fault tree analysis is useful both in designing new products/services and in dealing with identified problems in existing products/services. In the quality planning process, the analysis can be used to optimize process features and goals and to design for critical factors and human error. As part of process improvement, it can be used to help identify root causes of trouble and to design remedies and countermeasures.FTA is used by other RAM Commander modules – the Safety Assessment Software Module (compatible with aviation safety requirements, SAE ARP4761 and other standards) and MMEL (Master Minimum Equipment List analysis for aviation industry).